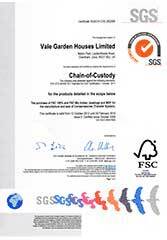 At Architectural Bronze Casements we are very serious about our environmental credentials and show our commitment by having a responsible approach to the production of the windows we enable our customers to make a socially and environmentally responsible purchasing choice. Efficient use of our space and manufacturing procedures results in minimal waste. We use the latest CNC optimising and cutting equipment, getting the very most out of all our timber and metals. We purchase the very best materials available and therefore will not allow any element of un-necessary waste. All operations from the design, through to going out to site are carried out under one roof and we are therefore not reliant on travelling for internal design and production meetings and excessive transportation of goods and materials. In a nutshell, we recognise the need for sustainable development and continually aim to improve the environmental effect of our activities. Meeting or improving upon relevant legislative, regulatory and environmental codes of practice. Developing objectives that target environmental improvements and monitor performance by regular review. Considering any environmental issues in the decision making process. Developing a relationship with suppliers and contractors so that we all recognise our environmental responsibilities. Educating staff so that they carry out their activities in an environmentally responsible manner. Promoting waste minimisation by recycling or finding other uses for by-products whenever economically viable. Promoting the efficient use of resources, energy and fuel throughout the organisation's operations. Bronze casements date back to the 14th century and there are many beautiful buildings in existence displaying their original windows, a clear indication to the sustainability of this wonderful material. Bronze does not require galvanising, or powder coating, needs little maintenance and is fully recyclable. Choosing bronze is an investment into the future. We are able to offer a low maintenance, slim metal window frame providing fine sightlines which can house double glazed units. You can replace old, inefficient windows with windows that have a traditional look and contain glazing units manufactured using the latest technology. Company policy is to utilise and reuse all waste produced in the manufacturing process. All of our frames are constructed from timber purchased from well managed sustainable forests, therefore aiding the preservation of the world’s timber supplies. Forest certification is a control mechanism through which these specific characteristics of forest management operation are attested to. This allows the consumer to identify among the products available in the market place those produced in accordance with specified standards. The FSC was established in 1993 and is one of the founders in defining generic standards in good forest management. FSC is currently considered the most important scheme of forest certification, having the widest spread accredited certification bodies throughout the world. 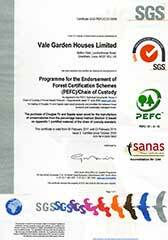 The PEFC was founded in 1999, and is the world’s largest international forest certification scheme. The world-side area of certified forest now under the PEFC umbrella scheme is in excess of 187 million hectares. Timber Research And Development Association (TRADA) membership is reliant on the use of products that perform to industry standards. TRADA also advise companies in best practice within the industry. 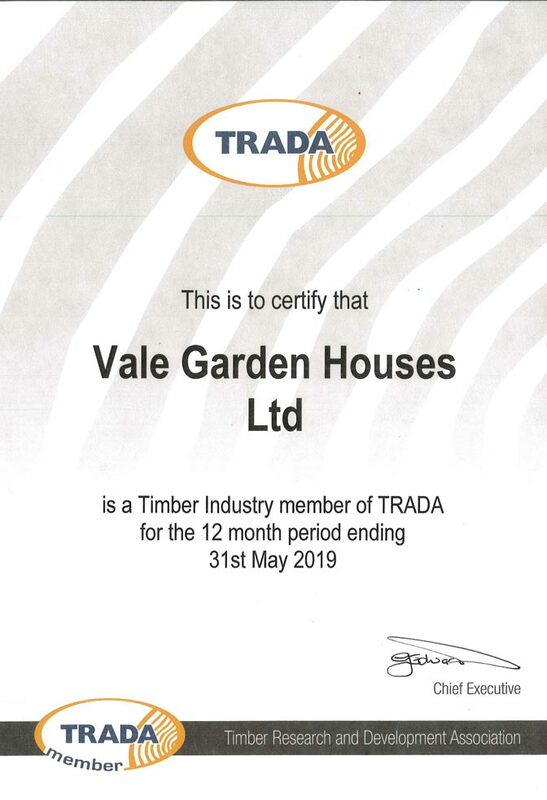 Sister company Vale Garden Houses have been members of TRADA for many years and they are heavily involved in performance testing of our bronze window and door systems for wind and water pressure and other elements of our build. As part of our environmental credentials we are conscientious regarding good management of our waste products and recycling, investing heavily in this area. The following applies to all areas of manufacturing and not just Architectural Bronze Casements. All waste timber produced from our processes is put to good use. Sawdust and wood shavings are collected each month by a recycling company to be used as animal bedding. Timber offcuts are stored throughout the year and are incinerated through the winter for heating the factory. Some timber is given to a local company who cut it up to make kindling. All glass offcuts and breakages return to a glass company for recycling. Any offcuts of our bronze and brass are returned to the manufacturers of our extrusions for recycling. Cardboard is sent for recycling for regeneration of packaging, or alternatively it is turned into fuel briquettes. Paper waste is shredded and used as packaging, or alternatively collected for recycling. We also have our own recycling machine for thinners which are used in the paint department. The process is stilled in a vacuum chamber allowing for 100% repeat recycling. Finally, waste powder used in our powder coating department is filtered and reused.